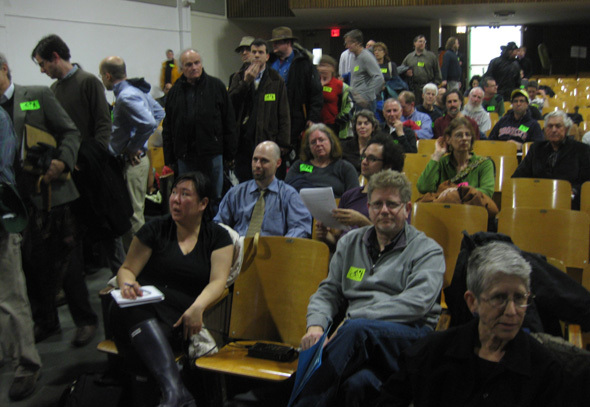 The line to testify before last night's public hearing on the Prospect Park West redesign. Supporters were sporting neon green and hot pink "bikes love peds" stickers. The gentleman with the shaved head in the center of the frame later testified that he's a registered Republican living in Park Slope, and he supports the redesign: "I want more families biking in New York City, because I am pro-family." I’ll have a longer post later today, but for now, here is the numerical recap from last night’s public hearing on the Prospect Park West redesign. The overall headcount was somewhere around 400 people. Transportation Alternatives handed out pro-bike lane stickers to 330 people before they exhausted their supply. Among the 100+ people who signed up to testify, support outweighed opposition by nearly an eight-to-one margin. 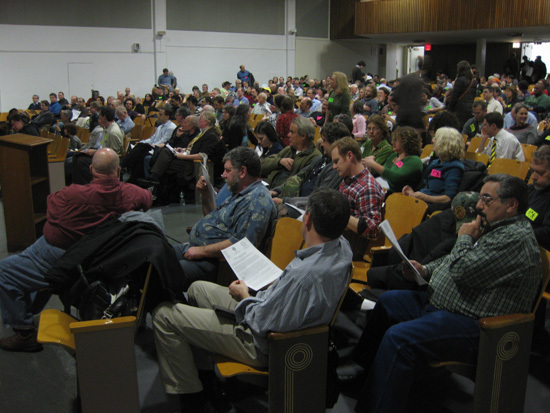 Public sentiment about the Prospect Park West redesign is not monolithic, but last night’s attendance — on top of last October’s rally and the survey of 3,000 Brooklynites conducted by Council members Lander and Levin and CB 6 — once again demonstrated that the current design enjoys overwhelming public support. Everyone who wanted to testify against the redesign got to speak last night, but less than 30 percent of the people who wanted to testify in favor got a turn at the mic. The John Jay High School auditorium a few minutes before last night's hearing got underway, while people were still filtering in. Thank you, just thank you. As one who was out of town and unable to attend, I’m deeply grateful for all who were there making the process work the way it’s supposed to and not sitting home and allowing influence to be bought. funny how all the cons spoke, but only a small percentage of the pros. Naturally, all 11 detractors were allowed to speak. Were the same relative proportion of detractors allowed to talk as supporters, only 3 nay-sayers would have been able to take the microphone. Why were only 30% of the bike lane supporters allowed to speak while 100% of the bike lane detractors were allowed to speak? This is not fair in the least. Did the chair of the meeting have that kind of discretion and authority to allowed such a biased percentage of testimony? The board chair allowed supporters to testify in groups — three or so at a time — but that wasn’t enough to give supporters time at the mic in proportion to their numbers. Looks like a pretty healthy public process…especially if you factor in all the history. I hope the courts respect the will of the community and the City Administration. The Chair of Manhattan Community Board 7 was much more fair when faced with a similar situation concerning the Columbus Avenue bike lane. He let everybody speak. The public were called to speak in the order in which they had signed in. And to handle the volume of people, the chair limited the allowed time for testimony from the normal 2-3 minutes to 1 minute a piece, and strictly enforced that time limit. That structure would have been far more far fair, and would have given a more accurate representation of the percentage of support for the lane. The handling of this Brooklyn Community Board 6 meeting shows that more people who are supporters of transit & bike/ped infrastructure need to get on the citywide community boards! Community Boards need to reflect their communities but I see far too many community boards who have a strong bias towards motorists and who are against progressive change in favor of bike/ped safety. If only you were writing headlines for the Journal, Alon. Next time have everyone who wants to speak in favor of the bike lane come with a written statement. Anyone who can’t speak due to time limits will hand the written statement to the board before they leave. In some way they will still be heard and written statements will become part of the public record. Spartacus, who would you “have” do that? You make it sound as if the community sentiment in favor of this bike lane was somehow being directed from above. I would ascribe the best of intentions to CB6 and chair Daniel Kummer, even if the presentation order didn’t give an accurate representation of the community support for this project. Consider that he began the meeting by running through the four-year timeline that got us to this point. I think he was entering evidence, so to speak, that this process has been something quite different from the closed, secretive collusion between advocates and DOT that NBBL claims. Therefore, perhaps the disproportionate speaking time given to opponents was an attempt to neutralize this criticism even further. No one who has followed this process can claim with any honesty that he or she has not been given ample opportunities to offer input. The disconnect between what happened in that room and how it’s been portrayed in the WSJ, Post, and elsewhere was going to happen either way. Had opponents’ speeches dried up after 10 minutes, and supporters’ speeches stretching until midnight, you still would have read that this bike lane has “divided” the neighborhood. Kummer probably knows this and figured he should at least give opponents the very thing they claim they have never had. NBBL members must live in some other dimension or at least in some other city. How can they complain about traffic jams and slow traffic? As anyone who has driven on the BQE can attest, every road in Brooklyn experiences slow traffic, bottlenecks and traffic jams. If the highways are crowded why should we cry for one mile of road next to a park? The stats by DOT (and unrefuted by NBBL) show travel-times on PPW have remained the same since the lane was put in. Their gripes have nothing to do with that. I wanted to speak but I was not allowed because ALL of the Con people got a chance. This was my statement. Even thought I live on 8th Ave so I hope my opinions count as much as those who live on PPW. First I am a member of the Prospect Park Track club. As a pedestrian, the Class 1 bike lane makes it easier to cross the street. As one approaches the bike lane from either direction one can easily see if a bike is coming for blocks. The stripped zone between the parked cars and the bike lane give more than enough room to see past even the tallest SUV. This stripped zone also gives drivers room to get out of their car with out “dooring” a bike. I am also a member of the Automobile Association of America. As a driver I am glad to see the bikes off the road and onto their own protected bike lane. PPW is now one road were I don’t have to be worried about a bike swerving in front of my car because the rider is about to be doored or because a Fresh Direct truck is using the dangerous Class 1 bike lane to store their vehicular while unloading. For everyone who didn’t get to speak at the hearing last night, you can still submit your written statements to CB6. This is their email: districtmanager@BrooklynCB6.org. I’m glad I turned in my written statement last night in addition to signing up to speak, since I didn’t get to speak. I too was somewhat frustrated with proportionally more “cons” getting to speak than “pros”. And I would have liked to hear supporters deconstructing opposition’s arguments and proposals instead of sticking to their notes. Some, like Eric McClure, did just that. But, overall, I think the chairperson was fair, considering that the aim of this hearing was to get community’s input on DOT’s proposed modifications, not to register your opinion for or against the PPW bike lane. I was one of the people last night who was unable to speak because time ran out. i did submit written testimony. However, I think the chair ran the meeting quite well all things considered. The key for the evening was to show that those present overwhelmingly were in favor of the bike lane and that was clearly accomplished. It was also very important that those opposed be able to express the reasons for their opposition so there can be no claim that their voices were not heard. The paucity of their numbers was telling and that they all could speak was essential. In terms of the actual syntax of the meeting, the support voices were heard both by means of the actual statements and testimony, and by the size of the turnout and the vast support. It was not unfair that time ran out and some people (myself included) could not speak. The fact that all those who could not speak were pro-bike lanes was actually beneficial. The evening demonstrated that there was a paucity of anti-bike lane individuals and that all willing to speak could be heard and all their arguments could be expressed and still significantly more pro-bike lane voices were heard and the Committee understood how many more were still there ready and willing to speak. One factor I don’t think many people here consider is how close Schumer and Bloomberg are philosophically. This may be the only issue they disagree on, and I’m not sure it’s a very important issue for the Mayor. For example, the Mayor and Senator jointly commissioned and released a report on the future of the Financial Services industry back in 2007, calling for less financial regulation to ensure the competitiveness of the U.S. financial industry. They were worried that the laxer regulation of derivatives in London was causing business to move there. Of course the London unit of AIG killed that company and was a key domino in global economic meltdown. While the report has since been, shall we say, overtaken by events, what it shows is that in a professional sense Bloomberg and Schumer are close. For all we know, the Senator is being nagged “when are you going to call your friend the Mayor” the whole time he spends back in Brooklyn. I signed up fairly early and still didn’t get a chance to speak. 1) Frightened of being hit when you’re getting out of your car and onto the street? Now you have a sense of what nearly every second is like when you’re riding a bike in an unprotected lane. 2) Concerned that not enough people are using the bike lanes–just a “minority,” to use one con speaker’s constantly repeated word? Do the math on how many different people can use those parking spaces on a given day and start thinking about that word “minority” again. I thought that all but one of the con speakers were awful–defensive, dripping with contempt for anyone outside their tiny circle, gleefully self-contradictory and accusatory–but an unnerving number of the pro speakers were seriously off-putting. It wasn’t a chance to perform; it was a chance to engage. Virtually no one on the pro side made that distinction. The cons at least were savvy enough to pretend they cared. And the people in the “other” category were, as far as I can recall, just cons that spent more time waxing nostalgic about bikes. I was one of the last speakers, and I confess, I wanted to score points, not engage. That is because these people are not interested in ‘engagement’. Who of them proposed -anything- but what is essentially a return to what they had before? Daphna: So you want to see community boards composed of people who are proponents of progressive change in favor of bike/ped safely and not people biased towards motorists. Of course, you must have such ideal individuals apply for appointment to their particular board and explain why they want to serve. Then those applicants need to be favored by the locally elected Member of the City Council(a person who likely despises Comm. Sadik-Khan, according to MC Leticia James), or, better yet, the Boro President, Marty Markowitz. What do you think are the odds here? Hint: Rule #2 of incumbency is the power to deny. Be thankful if one such person among the 50 appointees makes it onto each board. You may now all resume dumping on the City Council and, don’t forget, the BP. Biking is a helpful way for exercising and it’s a family good time. I can’t get the point why they should put restrictions. Family bonding is essential way of developing good relationship. I vote for pro! It’s overwhelming to know that this program was able to catch audience’s attention. It simply means that they are responsible for other people’s welfare.